So here comes the disclaimer. 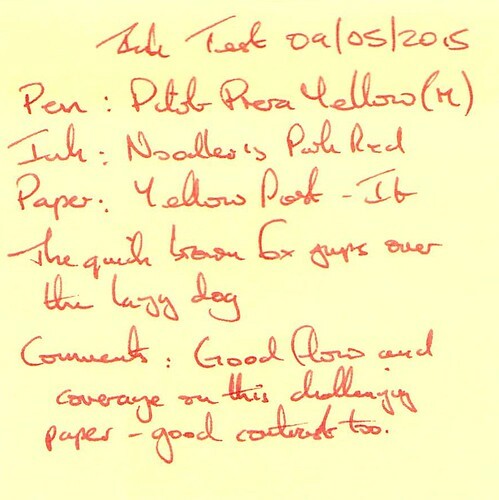 This ink was supplied free of charge by Pen Chalet. I was not paid to write the review, which is my honest assessment of the ink, and is not influenced by the fact it was supplied free of charge. I won’t therefore repeat the backstory here, but there also a Wikipedia page for Park Sang-hak. 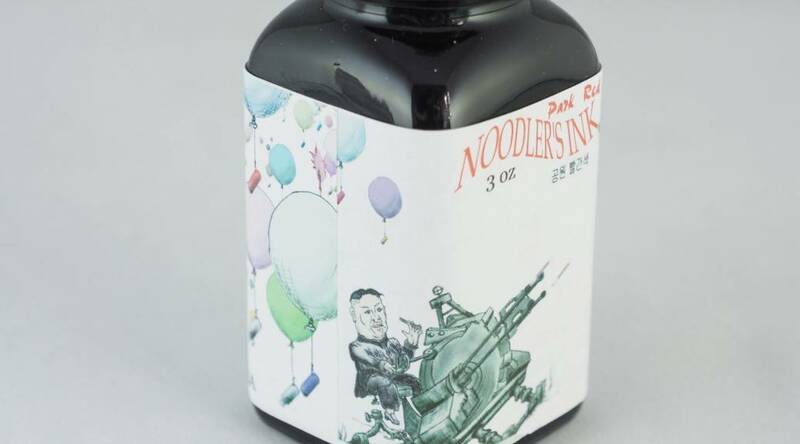 The ink normally retails at $12.50 for a 3oz bottle (excluding shipping), which would put it into the modestly priced category. From this review onwards I will disregard shipping costs in the value for money assessment – this varies so much with supplier and location that it distorts the results. 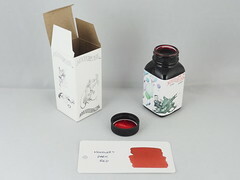 The box and bottle are the standard Noodler’s 3oz offer, and the bottled was filled to the brim. 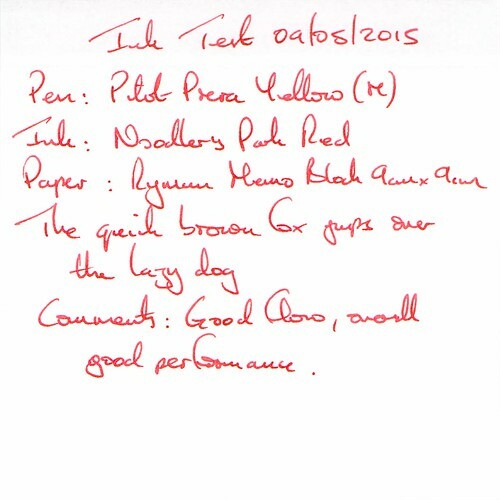 The test pen on this occasion was a yellow Pilot Prera. The ink showed some water resistance, leaving a pink line under running water, but text was obliterated by water drops. Cleaning was easy. Drying time was (by my standards) fairly quick at around 20 seconds. This ink is unusual in that it looks pinkish-red while still wet, which can be seen on the inside of the cap in the photo above, but this changes slowly on drying to take on a more orange tint (as shown on the Word Card). I was still struggling on how to describe the final colour when I did the writing test, and have now settled on coral (i.e pinkish orange). Again the photos give a fairly truthful representation of this colour. The moderate shading adds to the interest. 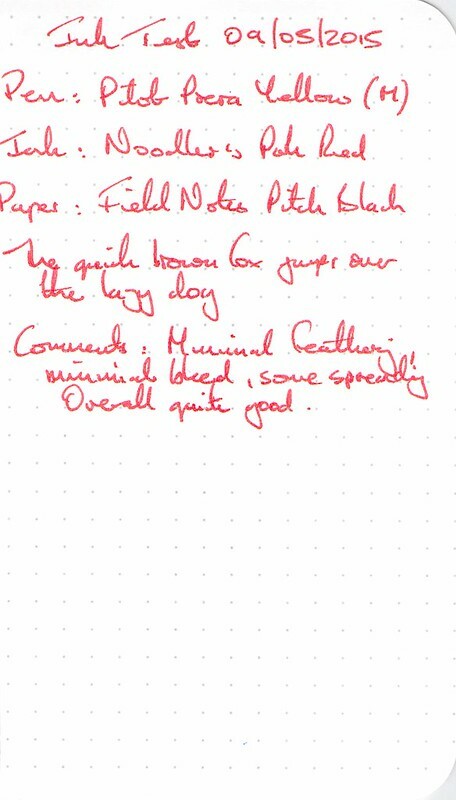 Overall the ink performs well without any flow issues or hard starts. Again good performance on this paper. On the first of the tricky papers flow and coverage were good, even over the top of the Post-It where there are traces of adhesive. 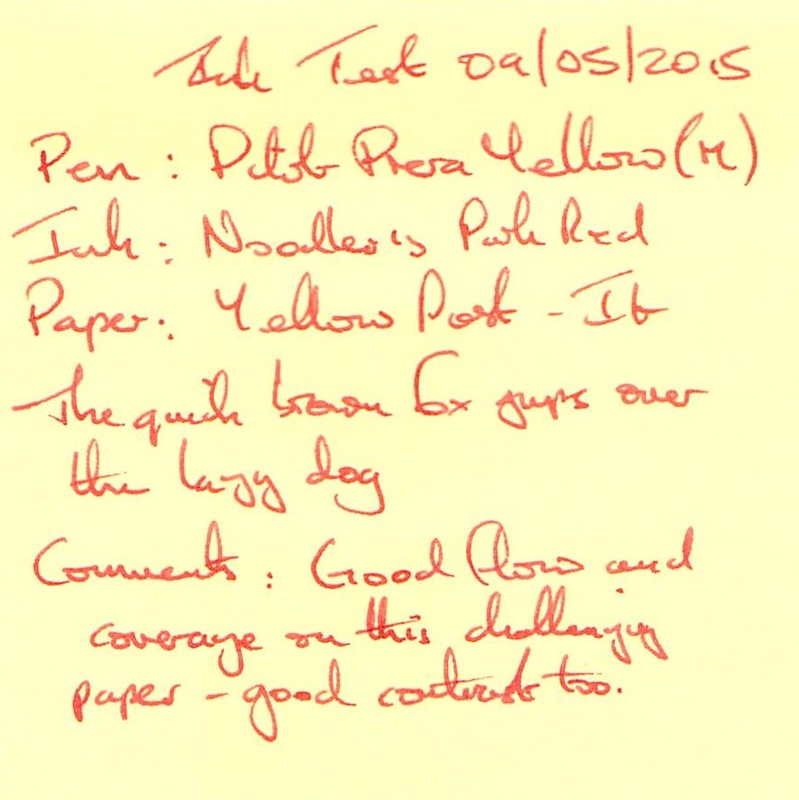 The ink also looks good on the yellow background. Surprisingly good performance on this paper too – only minimal feathering, bleed and spread. A fairly accurate representation of the colour, although the greater absorbancy of this paper seems to have masked the shading somewhat. Out of curiosity I decided to run the “cotton bud on a Ryman Memo Block sheet” shading test, which I haven’t used in a while. 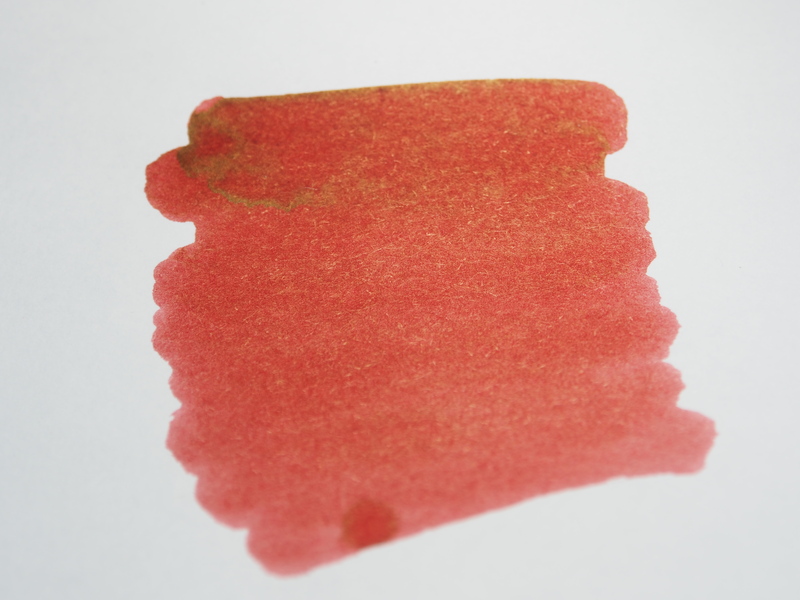 The result wasn’t as dramatic as with inks known for their shading properties, but at the right angle it did show a green sheen which had not been apparent before. 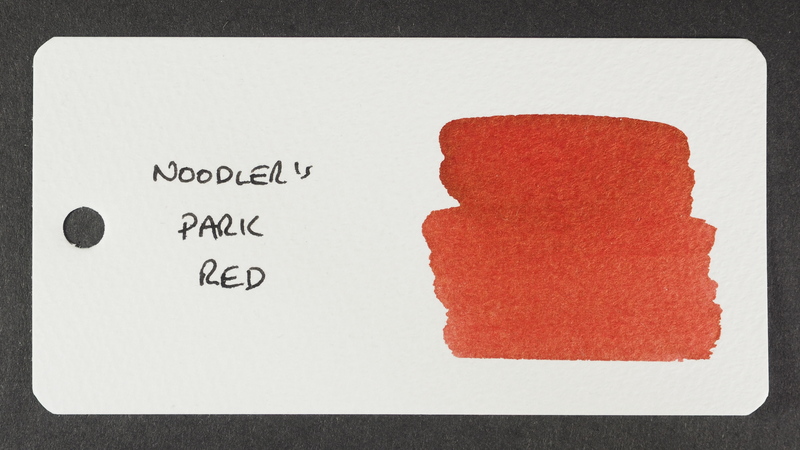 This is a good performing Noodler’s ink, without the quirks of some of more interesting colours, such as long drying times our cleaning issues. 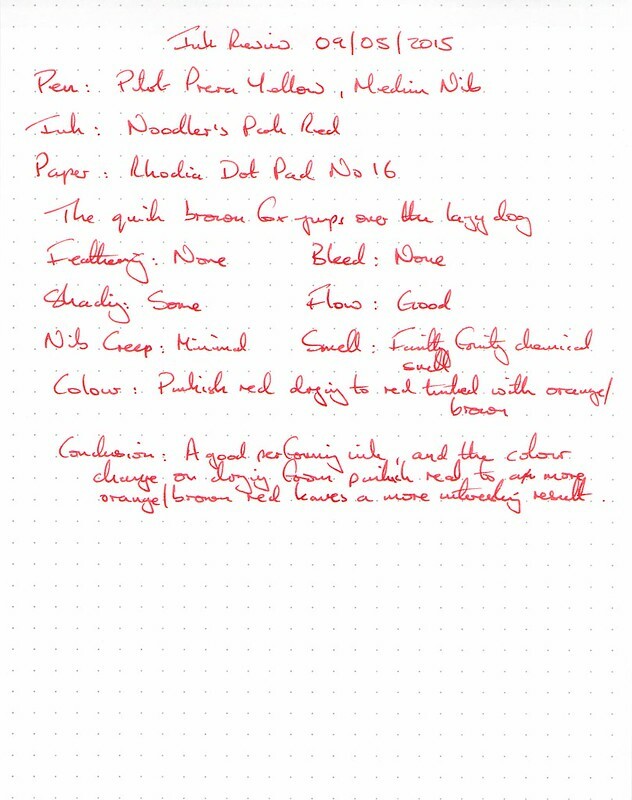 Suitable for markup, the more subdued red is easier on the eye than many, and the unusual shade means this ink could still be useful for general note-taking (at least if you want those notes to be eye-catching). I would definitely restock when the time comes. 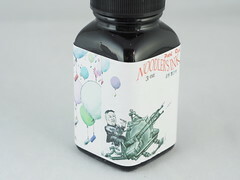 Thank you to Pen Chalet (penchalet.com) for the opportunity to review this ink.